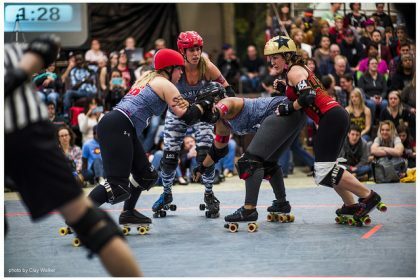 The Atlanta Rollergirl 2016 season is officially underway and if you didn’t make it to our home team opener, you missed some of the fastest and most intense derby that Atlanta has seen in a while. We welcomed fans with new bout layouts, the addition of food trucks, new transfers and fresh meat graduates and two fast paced, close matched games. If this double header was any indication, 2016 will be the year of home team upsets. 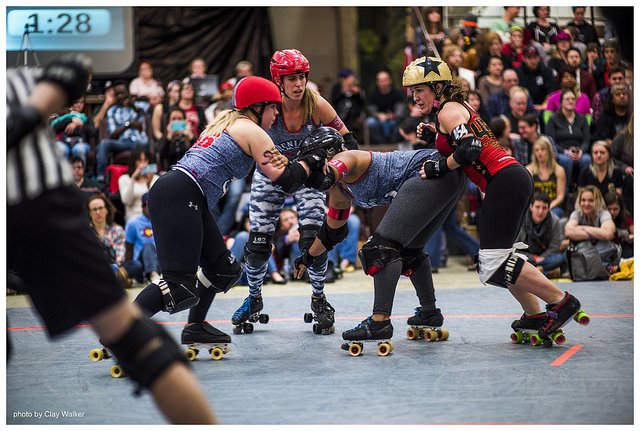 To open the evening, the Denim Demons’ power pack Wild Cherri, Nattie Longlegs, Erykah Badoozie and Curbstompin’ Cupcake buckled down and provided the defense necessary for Chokecherry to strike first and gain lead. 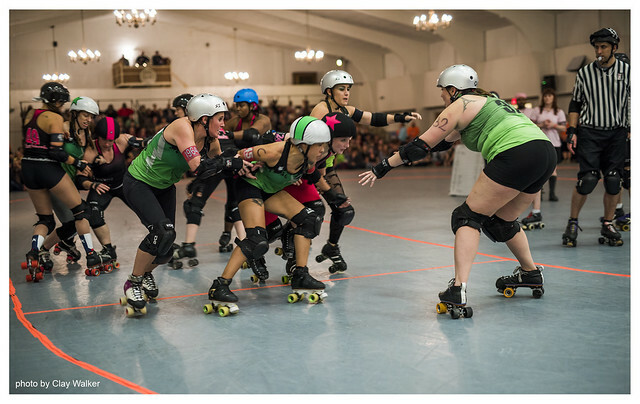 The Sake Tuyas responded with their own power pack, lining up Alicia Brains, Maul E. Cule, Luxfurious, and Charlie Chaos for their own lead jammer call and to take the lead. Despite continued solid walls and hard hits, along with a couple of perfectly executed cuts drawn by Koko, the Sakes were unable to hold onto their lead. The first half ended with the Demons ahead, 98-61. The Demons peppered the following 30 minutes with some last second big hits, but Sake jammers Hate Ashbury and Saikou were tenacious amidst the recycling. The second half saw a hard reset for the ladies in gold and, with 21 minutes remaining in the half, they had closed the gap, trailing the Demons 92-100. A poorly timed Sake track cut gave the Demons a chance to rebuild their lead and the Sakes found themselves unable to recover. A Demon track cut in the last two minutes of the game gave them a short rally period, but the Sakes were only able to cut their deficit to 29. Game two was an edge-of-your-seat rematch, brought to life as Afro Dykee burst through the pack and brought the Toxic Shocks their first lead. The Apocalypstix were close behind, though, taking their own lead the next jam. With 23:00 minutes on the clock, the two teams were momentarily tied, and then continued to trade lead as their jammers traded seats in the box. The second quarter saw the Shocks start to pull away with a lead and the half ended with them ahead, 108-77. The Stix answered with the first points of the second half and solid jamming from both Slams Mckenzie and Trouble MakeHer kept the score differential low. However, strong, slow walls with Eiffel Power and Baller Shot Caller allowed returning veteran Nora Gretz and new internal Shock transfer Remy Nah to keep a secure lead through the fourth quarter. Back to back power jams for the Stix looked like they could bring it back within reach, but when the jammers traded places in the penalty box one last time, the Shocks solidified the win.